We are introducing Style Steals for the Week for our lovely supporters and readers! Select pieces will be discounted over 50% off for a limited time. This week, our gorgeous Teardrop Earrings (offered in three colors, pink, purple and blue) are only $16!! This deal ends Saturday, October 15th. 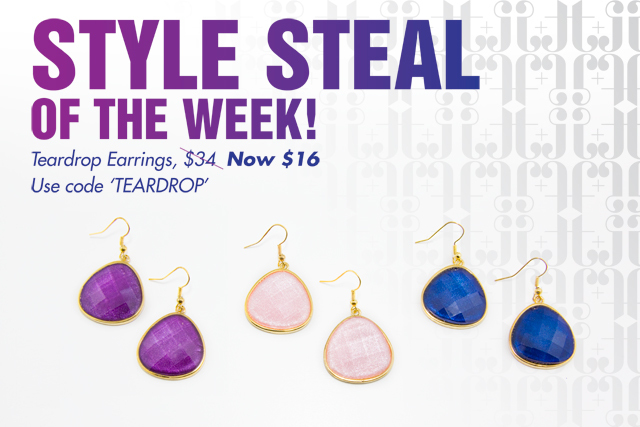 Don't forget to use promo code TEARDROP to receive your Style Steal. These are so pretty!! Love the colors.